The Baja 1000 is a highly technical and grueling off-road race that takes place in Baja California every year. Vehicles of all classes (including Trophy Trucks and Baja Bugs) jump dunes and navigate through deep silt during the 19-45 hours it takes to complete. It’s a race that never sees all participants cross the finish line. So it’s fitting, then, that Ford chose to test their all-new, highly modified, practically unstoppable F-150 there. They call it the Raptor. This is the truck that SVT got their hands on and made into a $40,000 off-road machine. The SVT team added components like special cast-aluminum SVT front control arms to improve stability, triple internal bypass FOX Racing shock absorbers to deliver a massive 12.1 inches of rear suspension travel and 11.2 inches of front suspension travel, 35-inch BFGoodrich All-Terrain tires to grip the ground like crazy and huge skid plates to protect the underside. It has a 6.2-liter V-8 engine that growls when you step on the gas and puts down 411 hp and 434 lb-ft of torque to top it all off. Unsurprisingly, the Raptor is a beast off-road and seemingly floats over most everything the earth tries to put in its way. The exterior looks the part too – especially in the unique orange paint – yet the interior is spacious and well appointed. 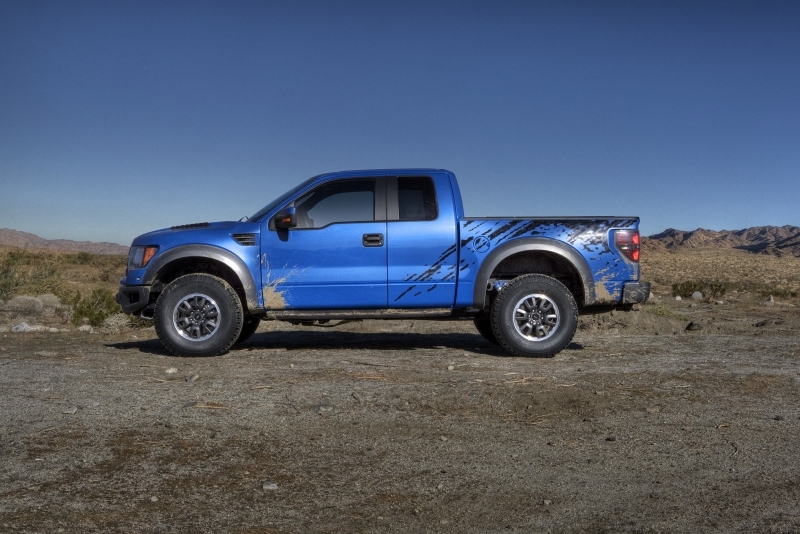 The Raptor a truck worthy of its ferocious name and one bred to conquer the impossible. And it’s all yours for just 40 grand. This truck can jump about anything, navigate terrain you probably shouldn’t attempt to cross and absorb bumps like nothing we’ve ever seen. All this, and the interior is still remarkably comfortable and spacious. You’ll get a thumbs up from everyone who looks your way, and the noise of the V-8 will turn the heads of the rest of them. Performance to price ratio is amazing. If bouldering and highly technical off-roading is your cup of tea, there are better vehicles out there suited for your sport. Enviro-friendly buyers, please look elsewhere. But speaking of that, how about an Ecoboost engine in this truck? The Raptor is a demon of a truck, and off-road is where it was made to shine. Enormous suspension travel via triple internal bypass FOX Racing shocks means it absorbs every bump or rock in the way without much trouble – even the ones that you’re convinced it can’t handle. But where the modifications are at their finest is at high speeds. Four-wheel traction and an off-road mode keeps the truck rolling smoothly over sand and mud with ease, and if slow speeds are needed, the hill decent control slows the engine so the vehicle stays under 20 mph on steep hills without your having to ride the brakes. All of this off-road prowess might allude to an uncomfortable ride elsewhere, but funnily enough, the Raptor is fairly docile on-road. Body roll is restrained in corners, though the suspension, when confronted with asphalt, feels too soft at times. Overall it’s comfortable and quiet in the cabin when it should be, and the Raptor assumes a luxury sedan-like performance when not blazing through sand dunes, which, hopefully, is where it spends most of its time. A massive 6.2-liter V-8 engine is a $3,000 option on the 2010 model, and one that’s well worth the money. It puts down 411 horsepower (91 more than the 5.4-liter) and 434 lb-ft of torque (54 more) as it rumbles through its six gears. Power is transferred through all four wheels, and the truck can haul a total of 12,400 lbs. Activate the off-road mode (after slowing to 5 mph) and you’ll find the transmission holds lower gears for longer and there’s less throttle response, perfect for those more technical stages on your journey. Auxiliary switches on the console are prewired to support a variety of aftermarket accessories. 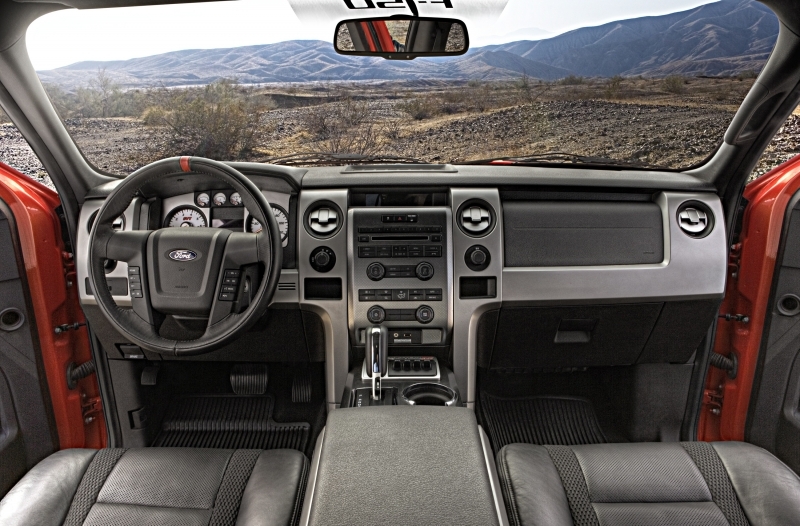 Along with handy performance features like hill decent control and the off-road mode, the Raptor comes with a number of tech goodies for use inside the cabin as well. Sync’s voice-activated system comes standard so you’ll be able to make that call home while you’re out traversing terrain. Sirius satellite radio connectivity is also standard. A navigation system is available through a $2,430 package, but a rearview camera system (a very handy feature) can be had for just $450. 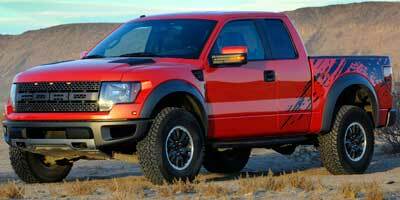 Due to low production volume, the Raptor squeaked by without needing a fuel economy rating for the 6.2-liter V-8. However, Ford mentioned that the larger engine choice would receive just slightly lower numbers to the 5.4-liter’s 14 mpg city and 18 mpg highway. You’d expect Ford to have gone hard-core with the styling of this extra special truck, but that’s not the case. 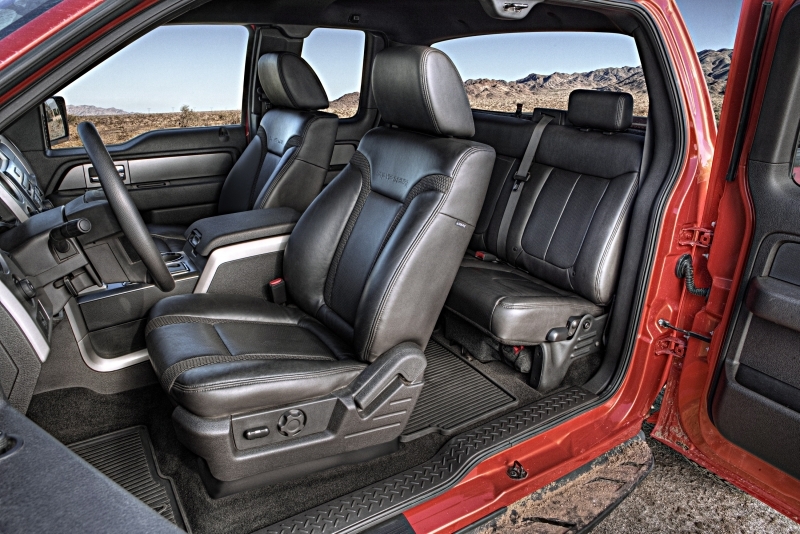 It’s a fairly luxurious cabin – despite a few nods to its F-150 heritage – with supportive seats and a good amount of features, including the same functionality expected from an F-150. Orange inserts and accents are available, but the added color somewhat cheapens the standard black-on-black look. The Raptor boasts a unique look that separates it from the F-150 lineup. A dominating grille is most apparent, as is the available molten orange paint color and optional mud spray graphics. Visible skid plates protect the front-end while LEDs are dotted along the front grille. 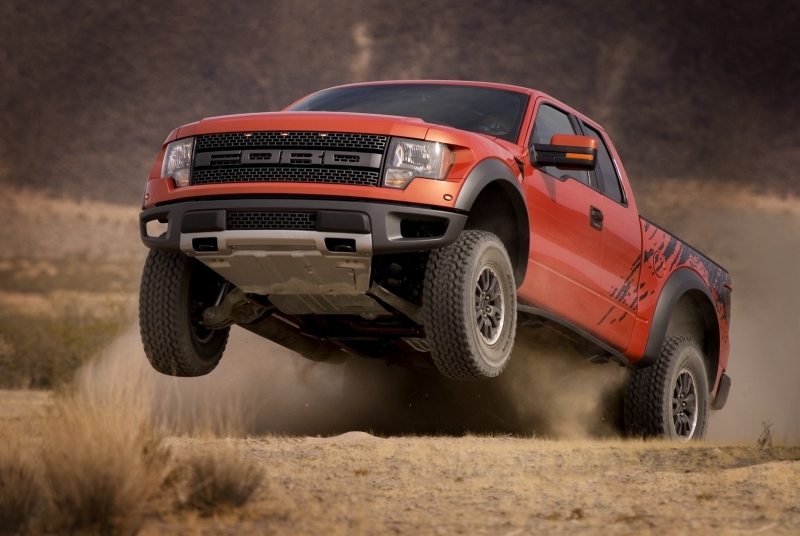 While there aren’t any direct competitors to the Raptor, we can say with certainty that it’s a deal for just $41,000. Many off-road enthusiasts build their own trucks hoping to mimic this level of ability and can easily spend twice as much. Those who are shopping for a wide range of off-road vehicles should take a look at the Jeep Wrangler and Land Rover LR4. Or you could try to build your own. Consider this the Superman of off-road trucks. Bred in Baja, this is the only truck to get if you’re itching to hit rugged trails at high speed. Thoroughly capable off-road, the Raptor also provides its occupants with plenty of tech to ease you along the journey and add comfort. For the price, there’s nothing better.